Spacious private studio with an open floor plan with mountain and pond views. 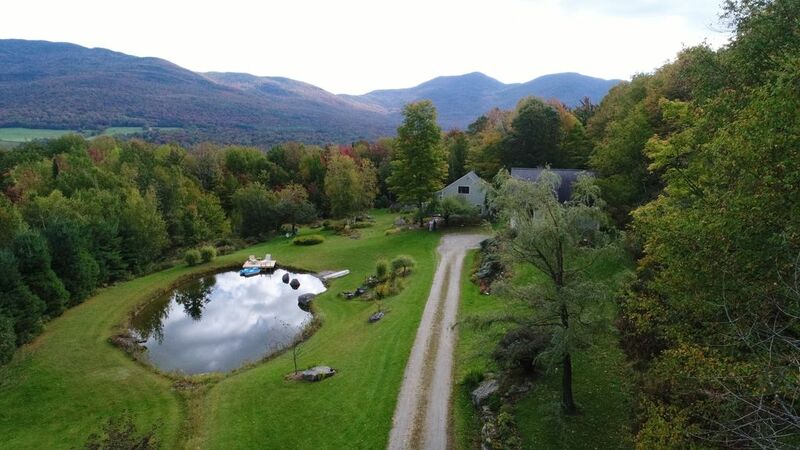 The Pondhouse is perfect for travelers seeking to combine vacation with a space in which to create, find solace, seek connection with nature and/or significant other…. This region of Vermont has long been a favorite to outdoor enthusiasts who enjoy skiing & riding, biking, hiking and paddling. Smugglers' Notch Ski Resort is ~ 3 miles away with alpine and Nordic skiing. Stowe is one hour away (in winter months) and Jay Peak is 45 minutes away. This area is popular with painters, writers, photographers and to the art community at large. Equally a favorite for foodies and craft beer lovers. If you enjoy locally grown and the slow food movement, this is a place to explore. Discover the best of the country's best craft beer and savior locally grown. The Pondhouse is a totally separate home/studio (30' x 32') with a private entrance that leads to fully equipped kitchen, dining room, bathroom with shower, queen bed, comfortable living room with faux wood fireplace. Enjoy the private patio overlooking gardens, a pond, and mountains. - Full kitchen with pots, pans, spices, etc. I am honored to have a home that allows me to share the beauty of Vermont. I lived in Vermont since 1974 take great pride in our cultural heritage and environment. If you are a lover of nature and culture--or desire a quiet, private get-away, this place will offer you many options. As an advid biker, skier, kayaker and all-around general outdoor enthusiast, I'd be honored to share the magic of the region. The Pondhouse has been called magical and enchanted. I've travelled and lived overseas and have served in the Peace Corps. To own a home (that actually has two homes) and allows me to host people from all over the world is a unique privilege. Now that I have offered The Pondhouse to others and I read the reviews and the notes that are left behind, I know that others cherish their time here and create special memories. I have been meeting the nicest people who love the magic of Vermont! The Pondhouse has been described many ways: "The "home" as well as the outside surroundings with the gardens and the mountains in the background are spectacular, peaceful and pristine." "Perfect weekend getaway to escape the city and find true peace and quiet. The house was tucked away and all you could hear were birds and frogs." "The Pondhouse felt like a home away from home." "If you are looking for a convenient, well- appointed, lovely spot to get away from it all, this is your place. The photos can't possibly do it justice." "It is a perfect place for a couples getaway, great space for cooking and enjoying a meal and each other." "It's peaceful with beautiful surroundings, yet conveniently located just down the road from the bustle at Smuggler's Notch." Come discover the magic for yourself! Cross country ski right to the door of the Pondhouse. Rannai gas heater for main heating source and a faux wood stove for ambiance. All linens and towels provided. If you need extra sets, please let Ellen know (or you can simply request upon your arrival). Please park at the end of the driveway just to the right of the apple tree. In winter, please park in the middle of this space (so the plow can move snow on both sides of your car). Propane gas stove and burners. Both a coffee maker and a French press. Note: no coffee filters are needed. The Pondhouse has a variety of teas and honey for your pleasure. Full kitchen stocked with coffee pot, French press, pots, pans, spices, cooking oils, baking pans, etc. The drinking water is from a deep underground well and has been described as 'fantastic water'. Direct tv and Ellen saves numerous shows, movies, news stations, and sporting events. The television can host a firestick/Roku. Please note that this is very northern Vermont and the internet speed is not too fast and not that reliable. Stereo has a dongle to connect to iPhone. Numerous books and magazines in the Pondhouse. Cribbage, backgammon, Monopoly, Yatzee, cards, and puzzles. Sleds, snowshoes, ski poles (for winter walks) are available for your use. 2018 Trek hybrid bikes. Lamoille Valley Rail Trail- 3 mi away; currently to Morrisville (17 mi away). A great 1/2 way prize: Lost Nation Brewery for burgers and brew or 10 Railroad Street and more! Enjoy the private patio with a table and four chairs, two Adirondack chairs and a small table. Beautiful perennial gardens and a view of the pond and the mountains. Three miles to Smuggler's Notch Ski Resort; 45 minutes to Jay Peak; one hour to Stowe Mountain Resort (due to route 108 closed for winter). You could play tennis @ Northern Vermont University-Johnson campus. Hard courts located ~ 13 miles away. The photos really paint an accurate picture of the Pondhouse. We had a great stay at the Pond House, it was a great place to start and end our day. Great location, gorgeous views and awesome owner! We stayed 2 nights and absolutely loved the Pondhouse. Perfectly located a few minutes from Smuggs and Jeffersonville. Ellen was an awesome host with the perfect local info. We can't wait to return! We had the best stay ever! Ellen was more than hospitable, we got lots of snow and she was totally prepared for it! She is filled with a wealth of knowledge as well! Her property is exquisite as it sits in a blanket of snow, the windows give you an epic snow globe effect, also the place was clean and warm even with -11 temps. She has board games Incase you need to warm up inside too! The kitchen is stocked with what you need... I left a few spices behind too! Plenty of blankets to get cozy and towels too. It’s just a charming piece of property with a warm and fuzzy feeling! I agree...it is 'snow bliss'; the magic continues and it really is a winter wonderland up here in northern Vermont! It was so great to meet you and host you. The host Ellen went above and beyond, providing us with everything that we needed to make the most of our stay. She is a fun loving, welcoming and generous person. The house and the surrounding areas are gorgeous. We will most definitely return to the pond house! It was great to share the magic of Vermont with you. I just received the very kind letter with the drawing of the sledding in the snowy mountains of Vermont...complete with the pond! It is a drawing that I will treasure. A priveledge to stay in this stunningly beautiful location. The pondhouse is a beautifully constructed building that was much bigger than it looked in the photos. We spent a lot of time by the giant picture windows, staring at the pond, woods, and distant mountains. The kitchen is stocked with all the equipment you need. It's great to not have to worry about things like bottle openers and plastic baggies (for instance). There is a nicely stocked market under 10 minutes away. And Smuggs is 10 minutes the other direction. Great mountain. Last but not least, Ellen is a gracious host who knows how to be accommodating and friendly and responsive, but gives you privacy as well. We enjoyed getting to know her. All told, our four nights in Vermont were ideal, and my long hours of research paid off. My only complaint is that we live 16 hours away - if it weren't for that, this would be a yearly trip for us. * Art - Jeffersonville (3 miles away) is an art lovers community with Bryan Memorial Gallery (Yankee Magazine: 'Vermont's primary showcase for landscape art') and other galleries. Rates are based on double occupancy. Best suited for one to two people. An additional charge or $25.00 per person per night / guest will be assessed. Occasionally I will allow well behaved dogs. Owner must sign a Pet Addendum; charge is $25/night for one dog. Cancellation Policy: If Guest wishes to cancel his/her reservation, the deposit will be refunded as follows: - 100% if cancelled 30 days prior to the Check-in Date LESS transaction fees (4% per transaction fee) - 50% if cancelled 5 days prior to the Check-in Date LESS transaction fees (4% transaction fee) - No refund if cancelled less than 5 days prior to the check-in date.